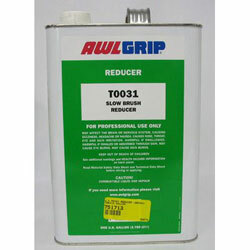 Awlgrip Topcoat brushing reducer can only be used with 545 Epoxy Primers, AWL-QUIK, and AWLGRIP when applying by brush or roller. SUGGESTED FOR PROFESSIONAL USE ONLY. Use T0031 in AWLGRIP Topcoats, 545 Primer, and AWL-QUIK Sanding Surfacer in brush/roller applications. T0031 evaporates very slowly, keeping the paint film open, maximizing flow and leveling while minimizing brush marks and roller stipple. For AWLGRIP Topcoats, add T0031 at 10 to 35% of the total volume of the mixed color base and converter. Application and cure temperatures between 60°F and 90°F (16°C and 32°C) produce the best results, with 70°F to 85°F (21°C to 29°C) being the optimum. T0031 is not recommended for use in spray applications. If a "retarder" reducer is needed for spray application, T0005 should be used.